The time to start buying Chinese stocks is now. Don’t let the trade war fears scare you. China has some of the largest and most innovative companies in the world, yet their stock prices in no way currently reflect it. Your Editor Zach Scheidt and I saw firsthand some of their technology last week at the Consumer Electronics Show (CES) in Las Vegas. It was nothing short of incredible. Drone delivery services, customizable batteries, wearable machinery to eliminate the strains of working in a warehouse… you name it. Chinese technology firms are innovating at the same rate as their U.S. counterparts, yet because of the ongoing trade war, these stocks are selling at a massive discount! JD.com (JD) operates a business-to-consumer online platform in China. There are two categories to their online platform — products which it buys and resells to consumers, and products it lets businesses sell directly to consumers. This is a very similar business model to Amazon here in the U.S. And it’s the preferred model by investors as it allows JD to control its supply chain — no untrustworthy sellers here. But more important than its business model — which Amazon has already proven deserves a high valuation — JD.com is one of the world’s most innovative companies. In fact, I’d go as far as to say that JD.com is even more innovative than Amazon itself. I saw this firsthand last week at CES. And I’ve got the pictures to prove it. Drones Aren’t Futuristic — They’re Being Used Today! I remember the first time I heard about Amazon’s plan to build flying drones to deliver packages. But my initial reactions were proved wrong when I stepped into JD.com’s exhibit last week. They’re already using drones in China! That’s right. As you read this, autonomous drones are currently delivering packages to hard-to-reach provinces and to buildings in busy cities around China. 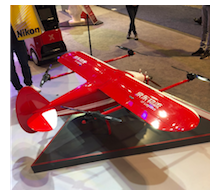 The drones come in various shapes and sizes, but the quickest ones can fly up to 100km/h and have a range of 100km, which broadens JD’s reach to rural towns that would be expensive to deliver to via truck. Here’s an actual fixed-wing drone with additional propellers for vertical takeoffs and landings. These are used for long-distance trips to remote provinces. The vehicle is completely autonomous and lands at a designated landing zone, where then the “last mile” is completed by a human. Here’s the newest version of a drone that’s been delivering packages around large cities since March of 2016. With multiple compartments, this autonomous vehicle can deliver many packages before returning to the warehouse. This is miles ahead of Amazon’s plans for a drone fleet here in the U.S. After all, Amazon’s Jeff Bezos’ claims of drone delivery began in 2013. And aside from a few test trials, Amazon isn’t close to delivering packages on the same scale as JD.com. 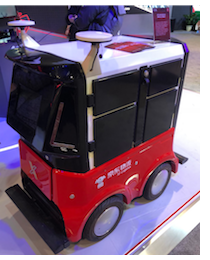 JD.com’s innovation streak doesn’t stop at autonomous drones. The Chinese tech giant also has two retail chains that operate hundreds of stores across China, largely without humans — 7Fresh and X-Supermarkets. X-Supermarkets are small convenience store-like shops (around 80 sqm) that offer around 500 products. Access is granted through facial recognition and payments are charged automatically to a credit card on file. The only job humans are responsible for in X-Supermarkets is keeping shelves stocked. 7Fresh is an upscale grocery store that opened its first location in Beijing in 2017. These large grocery stores (around 4,000 sqm) focus on fresh foods, including those that Chinese buyers consider rather exclusive, like Spanish Iberic ham, Japanese seafood, and French pastries. And chefs are on-hand to cook the food immediately if desired. Payment in these stores are handled through a mobile app. And just like X-Supermarkets, workers at 7Fresh locations only need to stock the shelves. JD.com plans to open 1,000 7Fresh stores around China in the next 3-5 years and even more X-Supermarkets. Once again, this is miles ahead of Amazon, who currently operates only 9 Amazon Go stores in the U.S., which begs the question —why has the stock of such an innovative company fallen 50% in the last year? The reason boils down to the trade war between the U.S. and China that’s been going strong for almost a year. Now, recently there have been a few positive developments in U.S.-China relations, namely the agreed upon “truce” until March and the positive talks in Beijing last week. Without a doubt these are positives for Chinese stocks. But the truth is, nobody knows every gyration the market will make in the short-term, which is why I’m recommending you build a position in JD.com over time. That’s because although the next few weeks or months may be cloudy, JD.com’s growth potential and proven record of innovation are real. And once trade war fears subside, I fully expect shares of JD to rise as the market gets back to valuing shares of JD.com appropriately. Happy Earnings Season! — This week kicks off the six-week window where the majority of publicly traded companies release their 4th quarter earnings results. On Tuesday, Delta Airlines, UnitedHealth, Wells Fargo, JP Morgan Chase and United Continental report earnings. On Wednesday, Goldman Sachs, BlackRock, Bank of America, Alcoa and CSX report earnings. On Thursday, American Express, Netflix and Morgan Stanley report earnings. And on Friday, Kansas City Southern, VF Corp. and Schlumberger report earnings. Insights to Watch — Earnings seasons are arguably the most exciting times of the year for investors. That’s because not only do we get the most up-to-date look at some of our favorite companies. But we also get valuable insights into certain industries and the economy as a whole. This week, some of the insights I’ll be on the lookout for include: 1) If the banks increased lending last quarter, as this will likely extend the economic cycle. 2) How do airline companies see 2019 shaping up? Are consumers still willing to spend big on vacations? And 3) How do commodity companies like Alcoa and Schlumberger see demand for steel and oil, respectively, playing out in 2019? Higher growth for these inputs would also likely extend the economic cycle. [Update] Classic Washington — Today marks the 24th day of the federal government shutdown. At last check, Republicans and Democrats are still not close to any material breakthrough — even after 800,000 federal workers missed their first paychecks on Friday. The key disagreement remains Trump’s insistence on funding for a border wall between the U.S. and Mexico. Functions not available during the shutdown include some routine food inspections, timely release of market-moving agriculture data, and U.S. reviews needed for initial public offerings of stocks. New Largest Gold Producer — Just this morning, Newmont Mining announced a deal to acquire Goldcorp in a deal valued at $10 billion. The deal is the second high-profile merger in the mining industry since Barrick Gold agreed to buy Randgold Resources Ltd. in September of last year to cut costs. The deal makes Newmont mining the world’s new largest gold miner by volume. Shares of Goldcorp are up around 8% as of this writing. Is Brexit Dead? — Although the action is thousands of miles away, Great Britain leaving the European Union is still sending shockwaves throughout financial markets abroad. And this week is primed to be the most important week yet. On Tuesday, the British House of Commons will vote on the exit deal Prime Minister Theresa May negotiated with the EU. Will the deal pass and Brexit be completed? Or will they be forced back to square one? Find out tomorrow. That’s all for me this Monday. Have a great week! Patrick Stout is the Managing Editor of The Daily Edge. Patrick is an experienced value investor with a degree in Finance from The University of Maryland. Early in his career, he spent time providing financial consulting services to startups internationally. After returning home, Patrick went back to what he knows best – valuing stocks and making money in the markets.